Lakshmî: Goddess of happiness; the eternal companion of the Lord in His Nârâyana-appearance, remaining in the Vaikuntha-worlds. Lanka: Island kingdom ruled by Ravana. Leela: (Lila): He plays on the stage that has no boundaries, His movements and activities. (BV-1), (RRV-1), Divine activities; so shaped that they suit the time, the person, the aspiration and the compassion which cause each shower of Grace (BV-35), (BV-40). The sport and pastimes, the adventures of the Lord. (Lina) - lIna: mfn. clung or pressed closely together, attached or devoted to, merged in (loc. or comp.) R. Sarvad. ; sticking Mahi1dh. ; lying or resting on , staying in, lurking, hiding MBh. Ka1v. &c. ; dissolved, absorbed in (loc. or comp. ), disappeared , vanished S3vetUp. MBh. &c. ; n. the clinging to, being dissolved or absorbed in, disappearance Pan5car. - Linga(m): Oval form, mostly made from stone, metal or gold. It is a symbol of creation and of God, who is without beginning or end. Baba creates lingams inside his body, coming out of His mouth, mostly at Mahasivarathri, a holy day dedicated to the worship of S'iva. (SSS-II) The linga is a 'mark' or 'symbol' representing the merging of the particular in the universal, the dissolution of the mind (with its agitations, aspirations and accomplishments that attach and adhere) in the atma-awareness. The wise realize that the mind and the vast phantasmagoria that it weaves are all subsumed in the linga, in the beginningless endless ocean of existence-knowledge-bliss. 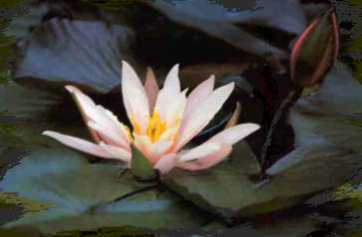 Lotus: Flower; Hindu symbol of beauty, purity and good fortune.